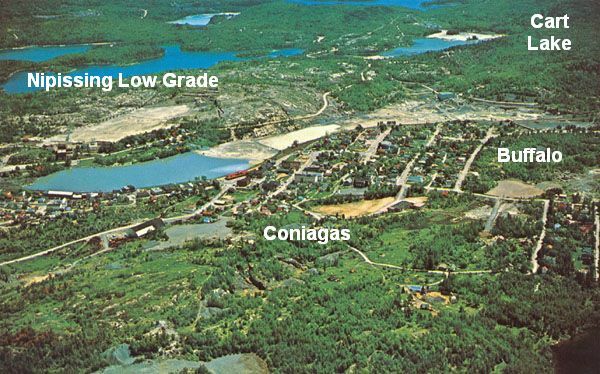 There are three main tailings deposits within the town of Cobalt itself � tailings from the Buffalo and Coniagas mines. These tailings deposits, as well as the Nipissing low grade mill tailings and the Cart Lake tailings are visible in the aerial photo below, taken in the late 1960s. At that time, Cobalt Lake was drained to reprocess tailings from the lake. The main tailings from the Buffalo Mine were deposited in a depression immediately north of the mill site. This location is now occupied by a trailer park established after the 1977 fire which destroyed many homes in the north end of town. Unfortunately, it is not known what, if any efforts have been made to reclaim these tailings, and the risk that they may pose to those living in the trailer park has not been assessed. In some areas around the trailer park, exposed ground looks much like tailings, but it is possible that this is clay that was used to cover these tailings. Future monitoring in the area should include an assessment of arsenic levels in the soils around the trailer park, and the risks, if any, to those living there. Interestingly, one resident of this trailer park has turned parts of the tailings near the foundation of the old low grade mill into an outdoor laboratory. Over the years, mulch and compost has been laid down, and a variety of types of trees and other plants have been planted. The area now densely vegetated, with several trees growing. This laboratory provides a possible opportunity to evaluate different strategies for tailings revegetation, and to assess the amount of arsenic in the leaves and other parts of plants growing on tailings. 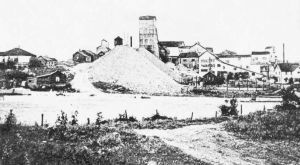 The Coniagas mill had two tailings deposits, one to the south of the mill, where fine �slimes� were deposited, and another to the east of the mill, for coarser tailings. The area where the slimes were deposited is now occupied by the Cobalt Public School. Before the construction of the school, the tailings were covered with a layer of rock and other materials. In the summer of 2006, the Ontario Ministry of the Environment collected samples from the school yard to assess whether arsenic and other contaminants are present in the soils, and whether or not there are any risks to students and others using the school year. The results of this work are not yet available. The coarse tailings from the Coniagas mine are located just north of the Cobalt area, and adjacent to a number of homes just south of the tailings. In 1974, it was estimated that there were about 31.500 tons of tailings in this deposit. Subsequently, almost 25,000 tons were removed in 1977 for reprocessing at the Canadaka Mill at Giroux Lake. The remaining tailings, as well as the foundation of the mill, and a small open pit west of the mill have been fenced due to extensive mine hazards, but there have been no efforts to date to reclaim the tailings. Some natural revegetation of the tailings has occurred.